The MAIA Young Agents support Make-A-Wish through grants from Trusted Choice and with our fundraising. Wishes are more than just a nice thing. A wish experience can be a game-changer for a child with a life-threatening medical condition. Trusted Choice® independent insurance agents are dedicated to the communities where we live and work. 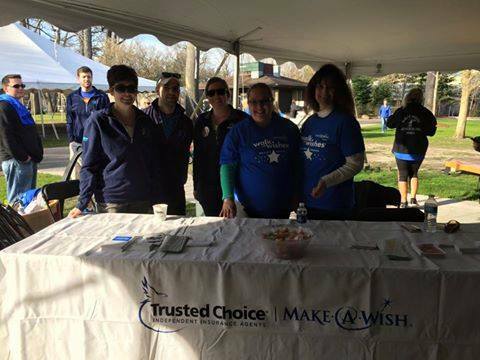 As a national sponsor since 2011, Trusted Choice has donated more than $2.5 million to Make-A-Wish®. We understand independence – it's the principle that binds our network of insurance agents and brokers into the largest of its kind. For Trusted Choice and its associates, independence creates the opportunity for flexibility, individuality and entrepreneurial spirit. The alliance with Make-A-Wish embodies each of these qualities. When kids are forced to fight for their lives, they lose the chance to make choices. From far-reaching big-picture plans to what to do over the weekend, they put everything on hold just to survive. With our support, Make-A-Wish kids can find their freedom once again. They regain some independence that can help them defy the odds or simply celebrate a new beginning in their lives.